In 1988—25 years ago on June 22—Who Framed Roger Rabbit became a box-office sensation. You can be forgiven for getting a bit nostalgic—especially since nostalgia was a fundamental part of that film’s DNA, as has been true of so many films that pushed the medium forward technologically. While it’s likely most memorable for its groundbreaking interaction of human actors and animated characters, Roger Rabbit combined plenty of elements that might just as easily have been disastrous as delightful. It was an homage to hard-boiled detective fiction and film noir, coupled with madcap cartoon antics. And it was a meeting of animated “universes”—Disney icons interacting for the first time with counterparts from Warner Bros. and other syndicated characters—that could have become all about silly ways to emphasize those unique interactions, like the Donald vs. Daffy ducks-“amuck” piano showdown. But the things that could have gone wrong, didn’t. 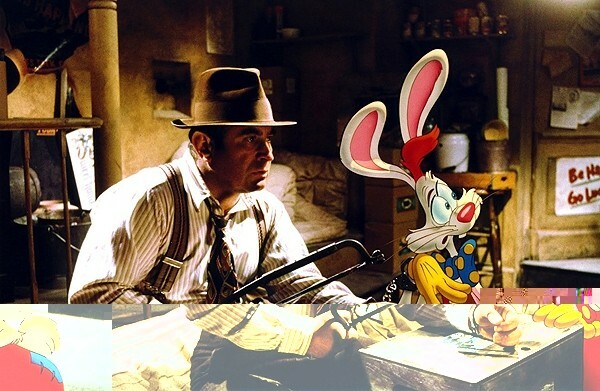 Very loosely adapting Gary K. Wolf’s novel Who Censored Roger Rabbit?, director Robert Zemeckis and company focused on the investigation by down-on-his-luck, down-in-a-bottle private detective Eddie Valiant (Bob Hoskins) circa 1947 into whether cartoon star Roger Rabbit (voiced by Charles Fleischer) was framed for the murder of gimmick-gadget entrepreneur Marvin Acme. That allowed them, in turn, to focus on Hoskins’ brilliant performance, which could have gone down in history simply for the deadpan way he responds to “What do you know about show business?” with “Only that there’s no business like it. No business I know.” He’s virtually creating a style of acting, one we now take for granted in the CGI era, as he goes along, reacting to and interacting with co-stars that aren’t really there. Hoskins holds this crazy contraption together; it makes perfect sense that all these animated characters live in the human world, because how else could this guy be doing all the things he’s doing? Zemeckis also knew enough to play off not just the unique physics of vintage cartoons, but also their love of wordplay. He had the luxury of being able to get a bit more risqué, so that one of the villainous weasels could reach into the bountiful cleavage of Jessica Rabbit (Kathleen Turner) and wind up with his hand caught in a “booby trap.” Yet he could also get a laugh out of both Eddie’s carefully worded nightclub drink order—“Scotch on the rocks … and I mean ice!”—and the inevitable arrival of the drink in a glass filled with actual rocks. ’Toons can’t resist going for the gag. Them’s the rules. Perhaps the most intriguing thing about Who Framed Roger Rabbit, though, especially with the benefit of hindsight, is how it fits into a long cinematic tradition of combining technological breakthroughs with fundamentally nostalgic narratives. The sinister plot at the center of Roger Rabbit involves Judge Doom’s (Christopher Lloyd) attempts to get control of Toontown to allow for the construction of a new “freeway”—this despite Eddie’s early comment, based on the efficient trolley system, that “who needs a car in L.A.?” The film nods to a time when people weren’t zipping around at 75 miles an hour—or at least not expecting to— and when a performer might have no greater aspiration than just making you laugh, even if it took a pratfall or 12. That’s generally been the way the movie industry has served up big changes in movie-making: combining the revolutionary with the reactionary. The landmark talkie The Jazz Singer was a story of generational change, about a man who wants to break away from the cultural expectations of his father; Star Wars ushered in a special-effects-heavy era with a throwback to the style of adventure serials; Toy Story introduced feature computer animation through familiar childhood playthings. We’re able to go along for the ride to a brand-new on-screen world because we respond to the basic familiarity of a world we’re happy to re-visit. Leaping ahead isn’t quite so scary if you’re being tricked into thinking you’re actually strolling down memory lane. Zemeckis, for one, certainly continued looking forward, becoming infatuated for several years with motion-capture animation in features like The Polar Express, Beowulf and A Christmas Carol. But you may notice a theme there as well: Zemeckis forged his new path through stories of characters we already know. For all its zany charms and state-of-the-art wizardry, Who Framed Roger Rabbit is almost quaint in its embrace of simple storytelling and simple pleasures. Like the title of Zemeckis’ best-known film suggests, maybe we all feel better going back to the future. June 27-28, 11 p.m.; June 29, 12 p.m.